St. Claude de la Colombiere, SJ, promoted the devotion to the Sacred Heart of Jesus and was the confessor of St. Margaret Mary Alacoque. Claude de la Colombiere was born of French noble parents in 1641. His young years were apparently happy ones, as he was close to his family and friends, leading an active social life. 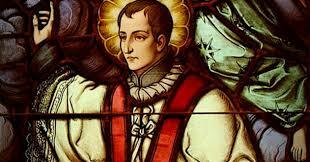 He entered the Jesuit novitiate at 17 and commenced a life of study and teaching. After his ordination he taught at the Jesuit college in Lyons, preached, and served as moderator for several Marian congregations. In 1674, after 15 years of Jesuit life, Colombiere took a personal vow to observe the Rule and Constitutions of the Society of Jesus. He discovered in this program of sanctity an experience of inner liberation and a greater ability to open his heart to others in ministry. In 1675 Claude was named rector at the Jesuit college at Paray-le-Monial, France. While in Paray, Colombiere became the spiritual advisor for Sr. Margaret Mary Alacoque. The Lord was revealing to Margaret Mary visions of his compassionate heart for the world. Margaret Mary was filled with anxiety and uncertainty about what she was experiencing. The Lord instructed through Sr. Margaret Mary Alacoque that the world be devoted to his Sacred Heart. Colombiere assured Sr. Margaret Mary that her visions were authentic. He also instructed her to write down all that she had experienced. In accepting the authenticity of Margaret Mary’s visions, Claude de la Colombiere pledged himself to the mission of spreading the devotion to the Sacred Heart of Jesus. In 1676 Claude became the appointed preacher for the Duchess of York (later Queen of England). He moved to London, where he worked to reconcile former Catholics with the Church. In 1678 he was caught in the web of lies spun by Titus Oates about an alleged plot by Jesuits to kill Charles II. Claude, in spite of failing health, was first thrown into prison and later exiled to France. In 1682 Colombiere died in Paray-le-Monial.